With mugs in paw, and tucking in to Grizzly's delicious cherry and coconut slice, we were all feeling very content and happy. "Dad and Uncle Brian had a nice time at Armathwaite Hall, as did Fletcher and his pals", remarked Tetley. "Kiki was a very happy bear too, as she now has a boyfriend, after Dad adopted Brodie from the Toy Chest in Keswick", added Grizzly. "They do make a lovely couple", said Shaun. Meanwhile, Allen had the iPad in paw, and looking up said, "the weather this week looks to be quite settled with some sunny days, up to Thursday." "Good chance of a walk then", called out Little Eric brightly. A few more taps and swipes and Allen was on the diary page. "Hmm. Well Monday of course is out as that is Feizor day and Thursday Dad has an appointment with his osteopath, Andrew. So if we can come up with and idea, I can go and see if Dad is happy to go either Tuesday or Wednesday." "Well", ventured Little Eric. "On the last two walks we did 11 summits in total, which moved on my Outlyer challenge significantly, but there is still that list of five others spread all over that I have not tackled. So I wondered about one of those perhaps." Getting the book off the shelf, Tetley said, "the list Dad made is tucked inside. Here it is." We all scanned the list, and Shaun then said, "how about doing Knipescar Common, as it will get another in the Shap area out of the way." Then getting the map he went on, "if we come off the fell here, and then descend to High Knipe, we can take the path across to Whale, the circle back to cross the bridge and return via Bampton Grange. It should make the distance about 8 miles." "Good suggestion pal", replied Tetley. "Any summit is fine by me", added Allen, "as it gets me ever closer to the magic 1000." "OK by me too", chimed in Grizzly. So off Allen went, calling out, "fill my mug up again, please, for when I get back." "What a tea belly he is", laughed Tetley as he obliged. Before long Allen returned. "Yes the walk is on, although Dad would prefer Wednesday." In the end it was delayed later to the Sunday, because Wednesday was a dank cold and foggy day. Shap is over 1000ft above sea level, so we reckoned it would have probably persisted all day there, and we wanted to be able to see the views. As it turned out Sunday was rather a cloudy day with some light rain at times, so the views were not brilliant, and the tops mountains to the west and east were lost in the clouds. The quickest way to the start was north on the M6 to junction 39, then along the A6 into Shap, a long linear village straddling the road. At its north end, a narrow road forks off left to Bampton and Haweswater etc. "There are a couple of paths on to the scar, but we want to take the one by the sharp left bend", called out Shaun who was looking closely at the map. "According to Birkett, there is some limited parking nearby." The road is narrow and flanked by stone walls and we began to doubt this assertion. "There's the track to Scarside", called out Allen. "Right. It's just about another quarter mile or so, Dad", said Shaun. Then in a minute, "here we are!" We saw that there was a car already there, as Dad slowed down. "I think I should be able to squeeze in behind it, but need to turn round, so that my door is not against the wall and hedge." Just a little way on the entrance to a property called Field Gate, provided the opportunity. Safely tucked in off the road, Dad got ready, and we settled in the rucksack. Shouldering this Dad said, "right lads, off we go." The gate to the path was immediately in front, and beyond we headed up the rough path, following the two waymarks. So muddy and wet in places that Dad's boots just sank into the ground making for difficult progress. No other waymarks, after the initial two, so it was down to map reading skills, for which we were glad of our pal Shaun, and Dad too of course. "The walls come to a corner ahead, and we need to get over them to the left", called out Shaun. "That will be via that ladderstile then", replied Dad. Ascending the rough pasture beyond, Shaun then said, "We should make for the gate in the wall on the right by the top corner. Then through that the follow the wall on the left for a few yards to its corner and then turn left." "You are very clever", said Little Eric in wonder. "It's just practice lad", Shaun replied. "I'm sure you will become as skilled in time." Dad did just as he said, and soon we were descending towards the sad forlorn and long abandoned ruins of Low Scarside Farm. "I wonder what stories these walls could tell about who once lived here, if only they could speak", mused Tetley. The route was now through the gate on the left and then round behind the ruins and up the slope. Again it was exceedingly muddy as Dad started up the slope, his boots slipping and sliding, and making him laugh out loud at the ridiculousness of it! "We should now find a gate through the wall at the top, on to the open land of Knipescar Common", advised Shaun. Here we were then faced with a wide expanse of tall and dense gorse bushes, that at first glance seemed to be impenetrable. "There seems to be a way through a little to the right", said Dad, striding in that direction. There was too, but as we walked up the wide gap that had been cut through, it became plain that there were a number of paths at right angles all along to allow passage. First making our way left, then at the next cross Dad turned right and climbed to the wide grassy path that runs beside the top wall. We followed this left as it climbed gently and latterly swung away from the wall, to come near the edge of the scar and continuing ahead, reached the highest rise and Knipescar Common's summit marked by a trig point ring embedded in the ground. 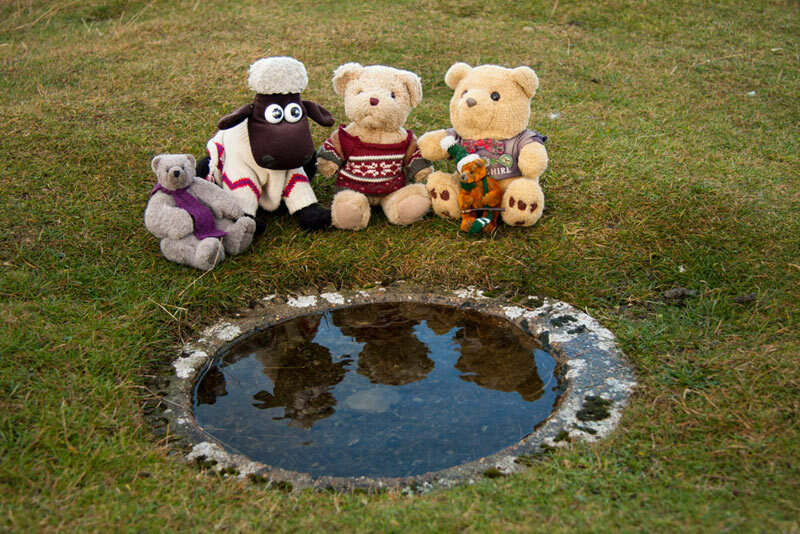 This was full of water, after the rains last night, so we were careful not to fall in as we sat round for our picture. "What a shame the views of the fells are not very good today", said Little Eric. He then went on, "is that Bampton Grange down in the valley?" "Yes pal", replied Allen, "and eventually we will walk along beside the River Lowther to there, at the end of the walk." "Time to be getting on again Lads", said Dad. "OK", replied Grizzly, as we all settled ourselves into the rucksack. After few minutes we reached the path and Dad dutifully headed down left, but some how none of us seemed to be concentrating and so we missed the right turn, losing more height than was necessary as we went on. After a couple of hundred yards Dad stopped, saying, "we have come to far back on ourselves." He promptly about turned and climbed up again, and then soon spotted our correct path, now off to the left. "However did we miss that", remarked Tetley. This led us to a gate, where beyond Dad made his way down the rather muddy path to High Knipe Farm. "The map shows we should go right here in the yard, but I don't see any sign", said Shaun. The farmer's wife had just arrived in her car, and seeing our dilemma, asked if she could help. Dad explained and she pointed out the bridleway sign hidden behind a large barn, when descending from the scar. Through the buildings the wide track led on, waymarked for the most part as the initial sign indicates, but not perhaps always when they were needed most. Early on it was here that we met the only other walkers, two ladies who it was to become apparent later were doing most of our walk in the opposite direction. Approaching, they had passed a group of about ten sheep that were wandering along the lane too. So, for a while we took on the roll of shepherd, as we walked behind them. Trotting along, they thankfully, after a while wandered into a field to the left, where the gate was open. "We cross this pasture half right here", instructed Shaun. This brought us to a rather ornate gate with another immediately beyond. "We need to go half left to that stile in the fence", called out Shaun. This took us past a line of three trees, their almost completely leafless branches stark against the winter sky. Beyond the next stile we crossed to a fence corner, where there was a completely faded and useless waymark. We were thankful to our trusty map reader Shaun, who called out, "we go right alongside the fence." It seems that at first this route had been waymarked with solid blue arrows, which had stood the test of time. For whatever reason someone had decided at a later date to supplement these with the thin painted yellow waymarks, that are most commonly seen around the countryside. Just a shame that the quality is such that they fade over time, and become useless. Yet another salutary lesson to always take a map! Thinking ahead as we walked along, Shaun gave us the next set of instructions. "We are heading for that wood called Hill Plantation, which we cross through." Beyond the next gate, we crossed the dip in the field and to a gate into Hill Plantation. This is in fact a narrow band of trees in a small valley. So it was down and then up the far side, going right to a gate to open pasture, to come to the access road to/from Whalemoor Farm. "I can see a waymark on a post on the opposite side", called out Grizzly. "Yes the path goes on up to the wood on the skyline", confirmed Shaun. "However this is where we leave the path, and go left along the access road that leads to Whale." This comprises a large farm that is part of the Lowther Estate, and the small hamlet, surrounding a green. The following picture shows this and some of the houses. Our Dad and Uncle Eric too are quite fascinated by the wall postboxes in these remote places, and here is the one at Whale. The GR indicates it dates from during the reign of King George V, 1910 - 1936. We like the assertion that it is for letters only, but it would seem pretty impossible to get anything larger in! "At end of the houses, we should take the signed path on the left", called out Shaun. On the way down the access road, we had crossed the rushing Whale Beck, and now we had to recross it, via this small bridge. "We now go through that gate and then ahead over the wide long field to emerge onto the road, which we follow to its junction with the road to Bampton" called out Shaun. This was where we encountered most of the rain but it passed over quite quickly. Close to the end the road dropped down and swung right to the gate onto the Bampton road, by the telephone box. As we emerged Tetley said, "there are those two ladies we saw earlier." Dad stopped to chat. One lady said that they had missed out a chunk of the walk, and looking at my map, it seemed that they had not gone far enough along Knipescar Common, to find the gate we had used this morning by the gorse bushes. "Where now", demanded Little Eric. "We take this signed path right, that leads down to the bridge over the River Lowther", replied Shaun. It was not all that far, but Dad let out a sigh of relief, as we arrived at the bridge, such was the extremely boggy state of the ground. "Wow, it's a suspension bridge", exclaimed Little Eric. Dad climbed the steps, opened the gate and headed across, the bridge bouncing as we went, giving us a rather curious sensation. Little Eric apart, this was not the first time we had crossed this bridge, having come this way with Uncle Eric in February 2007, on our first ascent of Knipescar. The shot Dad took of the bridge that day is the best, so we are using it for the story. "We go left along by the river now to the road into Bampton Grange", directed Shaun. Glancing left, Tetley called out, "that's a nice shot of Knipescar, bathed in sunlight." The village lies beyond the river bridge. The church is dedicated to St Patrick, and was rebuilt in 1726-7 from an earlier one on this site. It was first mentioned as a place of worship in 1170, when it was attached to Shap Abbey. "Can we go and have a look inside? ", asked Allen. "Sure", replied Dad, pushing the lych gate open. Looking at the notice board, Grizzly said, "there is to be a carol service tonight at 6.30." This explained why the heating was on, and why heavy curtains were drawn across the inner door, which Dad had to push aside. Then he switched the lights on to take the picture. The nave, aisles and west tower, that has five bells, date from the rebuilding. The chancel was restored in 1885. There are seven bays of side windows with the columns of the arches dissecting the pews. "It is a very nice church", said Allen, as we looked around. "Thanks for letting us visit. Taking our leave, Dad switched to lights off again, and took care to ensure the curtains were fully drawn across the doors to keep the heat in. Strolling on through the village, we spotted a seat by the roadside. "Can we have our picture taken?" asked Tetley. Dad is always happy to oblige, and as the seat was wet let us sit on his map cover, so we did not get wet bums, and in Shaun's case feet! "We keep on along the road Dad, to the car", said Shaun giving his final direction of the day. Shortly a road went on left, with a sign to the places we had visited earlier. Knipe - 'jutting crag' or 'rocky summit', here referring to Knipescar Common we had summited today. Whale - 'small rounded hill', this referring to Burtree Scar (on OS map) just to the north east. Shap - 'the heap (of stones)', a probable reference to the many ancient stone monuments in the area. So close now to the end of the walk, we dared to hope we would get away without any pictures of sheep. Sadly it was not to be as Dad spotted these two in a field by the roadside. What is peculiar, is the ears on the sheep in front. We are at a loss to explain. Soon the car came into sight, and once changed Dad drove home. As we rode along, we discussed the walk, and on behalf of us all, Tetley said, "thanks again Dad for taking us on yet another adventure. We have all enjoyed it."